I love sewing. It brings quiet. It helps one make connections with personal history. My mother and sisters taught me to sew many years ago. 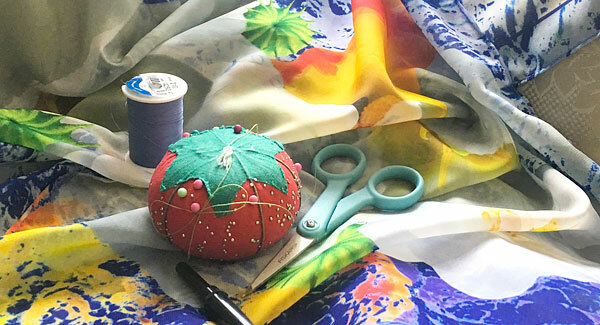 Exploring all kinds of fabric, texture and colors. My passion for the arts began in a fabric store looking for prints, lace and thread for doll clothes. Followed by patterns and zippers for my own clothes. And then, sewing special dresses for my daughter too! The sensation of peace often emerges as a welcome consequence of handwork. Sewing can allow one to move forward in an ordered fashion- without undue haste. In this way, it has the power to settle one’s soul. The results can be beautiful things and things for other people to enjoy. Like scarves. Those of us who work with color have experienced firsthand the challenge of seeing how fickle colors can be. Color perception is dependent on many things. Light, the time of day, fabric texture, the paper color, the kind of inks used. And when were the inks last changed anyway? 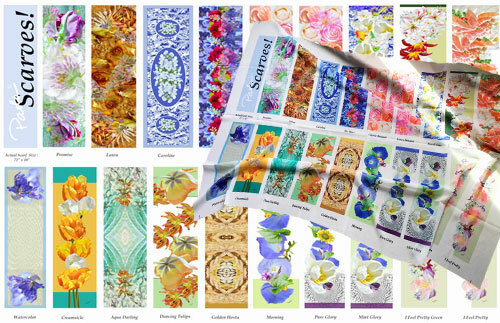 I bring scarves to sell at every event, but, this single yard printed with all the scarf designs gives people a chance to see exactly what they get. Each finished scarf is a luxurious 72” long by 18” wide. We’ve been kicking it to get ready for a fair the end of April. Generally, I don’t print and sew scarves ahead -unless they’re already purchased. I’d rather craft each one for a specific person. Fairs present a challenge in this regard. But, there’s a lot of impulse buying at a fair. So, I always try to have some on hand for those people. This year I’ve printed all our current scarf designs on a single yard- on the very same fabric I use for the finished ones. If we’ve sold a particular scarf someone wants, she can then see actual scarf colors printed on a sample grid and order from it. Custom made, no surprises! There are also a few scarves waiting to go home with people, that we made for holiday fairs. See them here. Spring is coming and the houseplants know it. Last week, I gave them all a dose of fertilizer and this week, they all woke up! 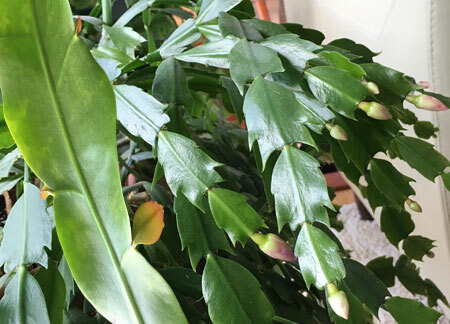 The night- blooming cereus is having leaf babies, the Easter Cactus is budding up and my wintered over geranium has two sets of flower buds starting. 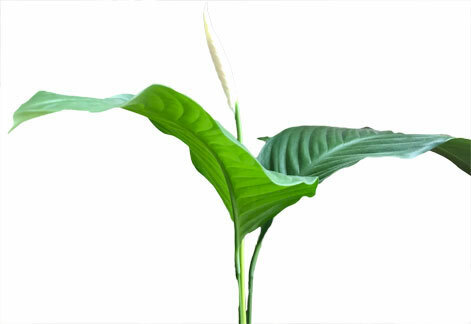 The peace lily came alive too. The leaves have filled out in number and size. AND, the plant has thrown up a flower- ready to open any day. Weeks ahead of last year. My sister found an article on the calming effects of sewing. I don’t embroider, but I recognize the wonder of working with one’s hands and the calming effect it offers. Gardening works too! Music has always been a wonderful way to slow down or focus inward on what’s important. Listen to Kacey Musgraves – there’s always a rainbow over your head- even when you don’t think a good life can happen for you. Rainbow.